What are latency and jank, and why are they important? Latency is a delay between input and response. Try dragging the two boxes below. I have no added latency and I feel snappy. I have 10 frames of added latency and I feel sluggish. Jank refers to short interruptions in the middle of an animation or interaction. I move smoothly because I am jank-free. My movement is periodically interrupted by 10 frames of jank. 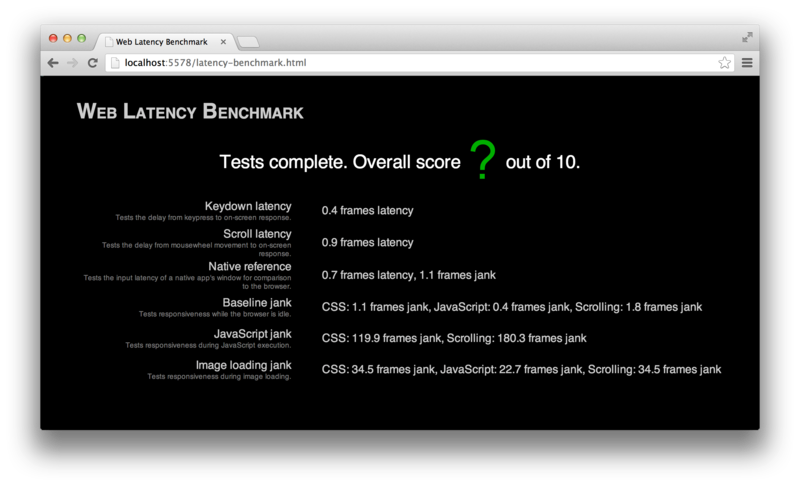 Regression testing: The Web Latency Benchmark can run in an automated mode suitable for regression testing of browsers. Pass "-a" as a command line argument to see the available options. Hardware support: If you happen to have an Oculus Latency Tester it can improve the accuracy of the latency test results. Simply plug it in and the benchmark will detect it. This project is maintained by google. It is an open source project, not an official Google product.